Learn Iron Condor Options Strategy| How to trade with Iron Condor? What is an Iron Condor options strategy? When to trade in Iron Condor? 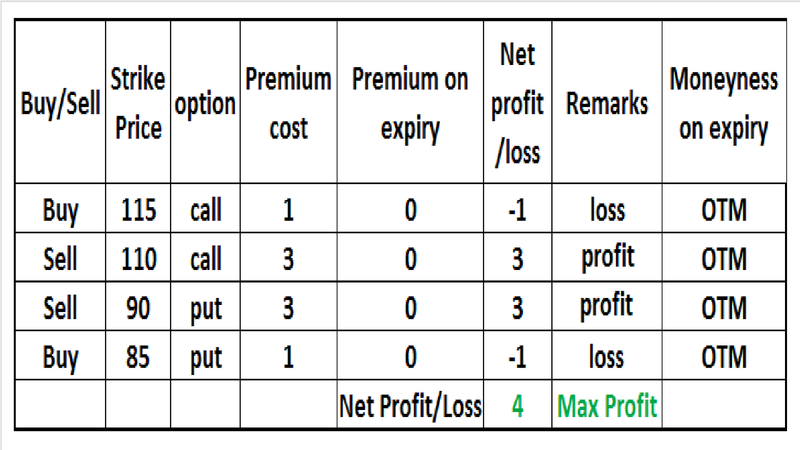 Iron condor an options strategy is best suited for range bound market conditions means you have neutral view on market. How Iron Condor generates profit? As we know that options prices get decreased with each passing day so Iron Condor is formed to take advantage of Theta Greek (time decay). As we already discussed that Iron Condor is built in range bound market conditions so there is less probability of wild moves in a share. Profit and Loss potential in Iron Condor? How to build an Iron Condor options strategy? 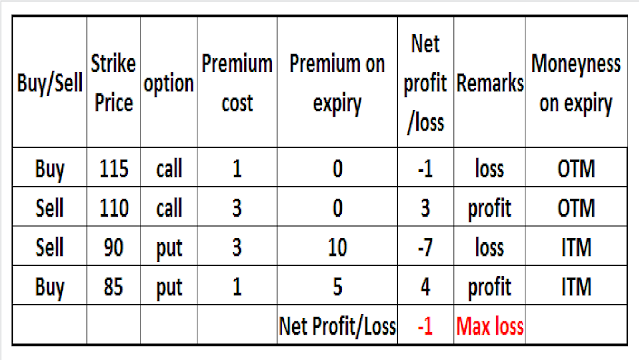 Iron condor options strategy is formed by selecting 4 out of the money options (2 calls & 2 Puts) of different strike prices of same stock having same month expiry, where an OTM call and put is being sold and as a protection, farther one call and put is being bought thus profit and loss becomes limited. But in this strategy the probability of profit is much higher. The width or difference, between the strike prices of call options (short & long) and put options (short & long), must always be same. 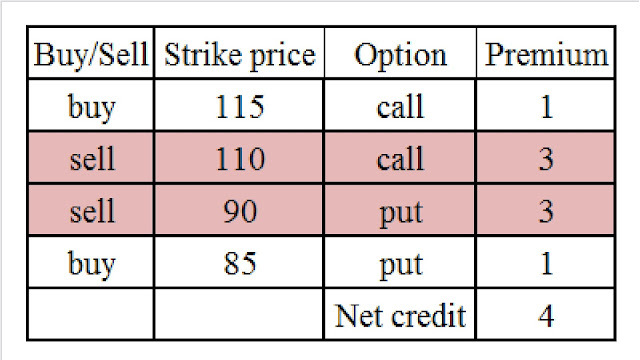 Like in above example the gap between short call 110 strike price and long call 115 strike price is 5 (115-110), similarly the difference between short put 90 strike price and long put strike price is also 5 (90-85). 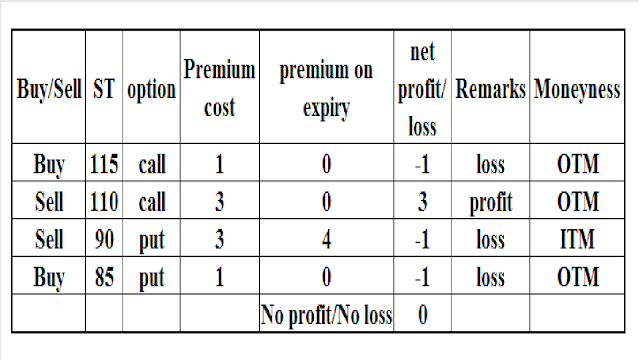 The Iron condor strategy is used to reap the benefit of time decay (theta greek) and we make max profit if all the options expires worthless.But there is no need to carry the strategy till expiry, you can close it even before the expiry if strategy is in profit. 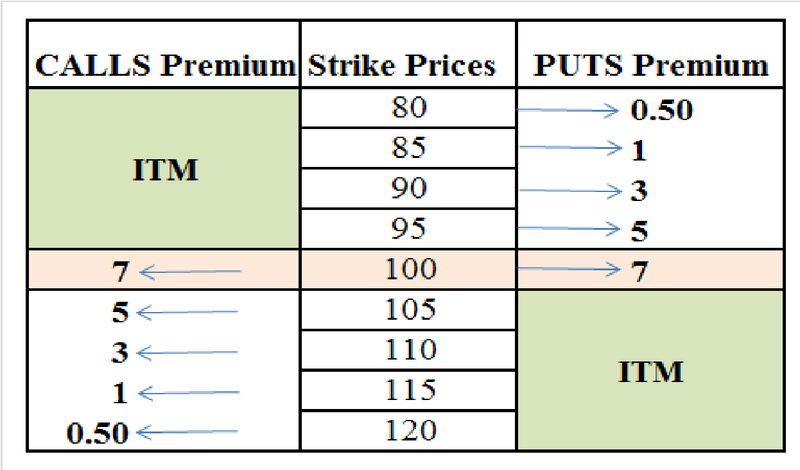 As we are expecting that ABC will not cross 105 on upper side and at the same time will not fall below 95, so to make the probability of profit more strong, we have sold one OTM call of 110 strike price @rs.3 and also sold one OTM put of 90 strike price @Rs.3 , these strikes prices are beyond the levels of movement as presumed, thus their chances of becoming "in the money" till expiry are rare. 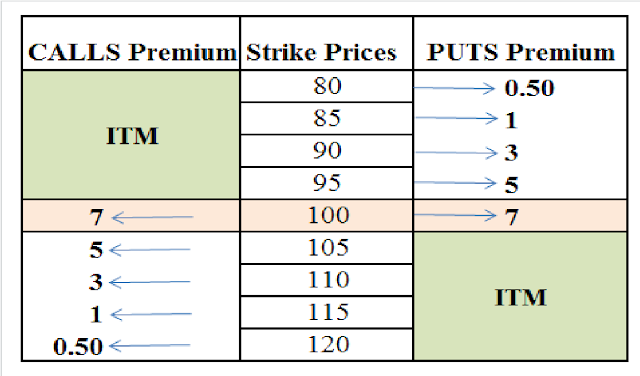 Now, as all of us know that stock markets are full of uncertainties and no body can predict markets accurately therefore to avoid any kind of risk by uncertain wild movements, we have bought even farther a call of 115 strike price at Re.1 alongwith a put of strike price 85 at a premium of Re.1. 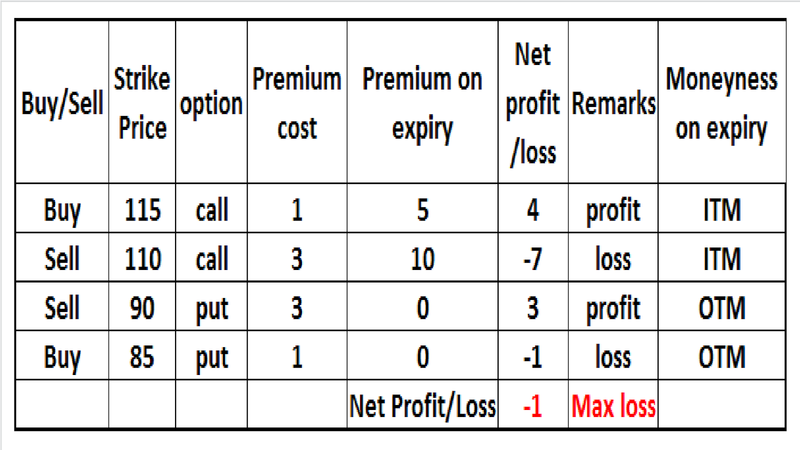 Explanation: We received credit of premium against writing (selling) of an option and has to pay premium against buying of options. 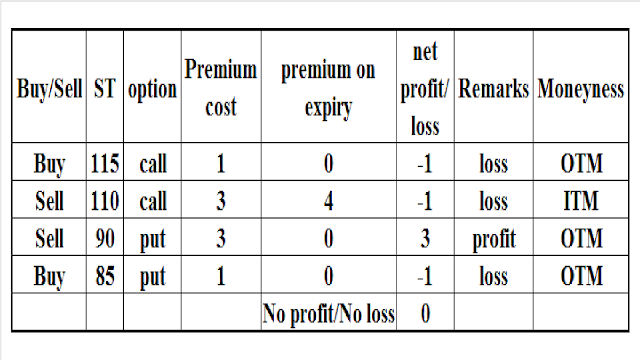 So, in above example we have sold one OTM call @ 3 and one OTM put @ 3 total credit of premium we will receive Rs.6 but to protect our-self from any uncertainty we also bought a call @ Re.1 alongwith a put @ Re.1 means we have to pay total premium of Rs.2.Therefore, we will receive net credit of Rs.4 (total sell premium-total buy premium). Now, in any market condition our max profit will be limited to Rs.4 per lot. 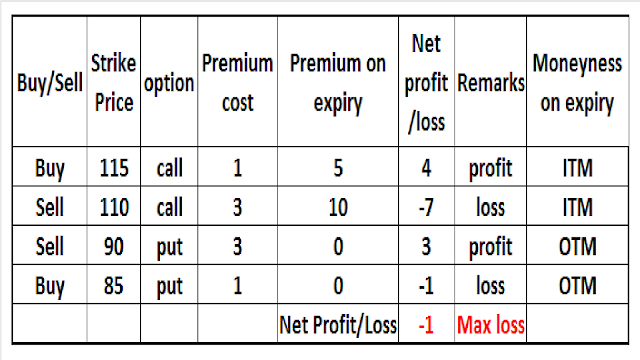 Our max loss will be limited to Re.1 per lot (width of strike prices-net credit of premium received), in this case the width of strike prices, which we have sold or bought, is 5, so 5-4=Re.1 is our max loss. Now, in any market condition we will not incur a loss of Re.1 per lot. If, Stock of ABC remains sideways and closes in between 110 to 90 say at 101, then we will make max profit of Rs.4 per lot. Interpretation:Our both call options( short & long) will close ITM (in the money) and both put options (short & long) will close OTM (out of the money) means worthless. So the bought call @ ST 115 will give profit of Rs.4(Intrinsic value or Premium on expiry-Cost) and the short call @ ST 110 will give a loss of Rs.7(10-3). 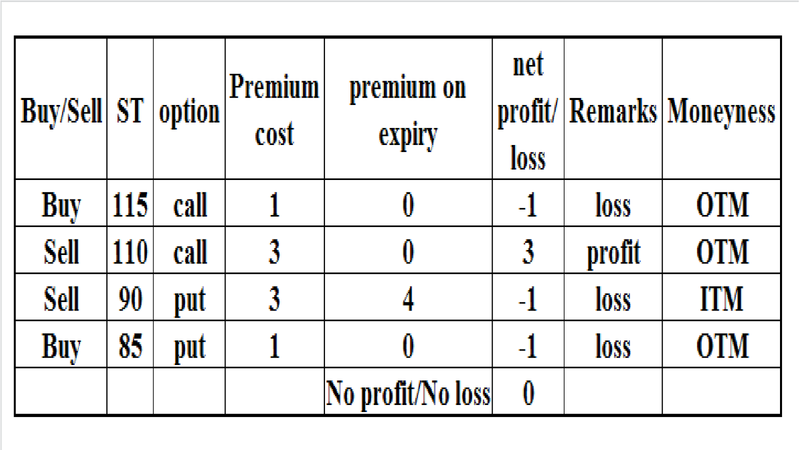 Put of 90 ST will give profit of Rs.3 because it has closed as OTM and the long Put of 85 ST will give loss of Re.1 as it has also closed OTM i.e. worthless. 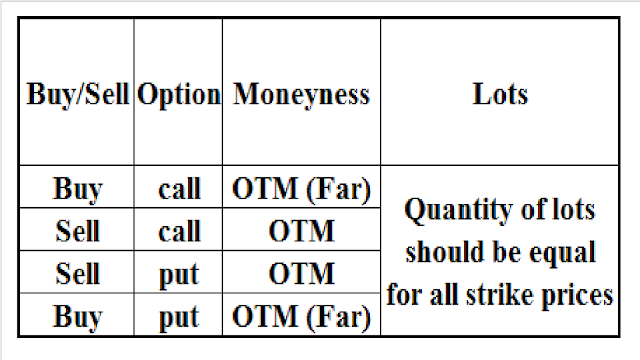 Interpretation: Both call options will close OTMs and both put options will close ITMs. The bought call @ ST 115 will give a loss of Re.1 and short call of 110 ST will give a profit of Rs.3 as it has expired worthless. And the short Put of 90 ST will give a loss of Rs.7 as it has closed ITM by Rs.10 and the long Put of 85 will give profit of Rs.4 as it has too closed as ITM by Rs.5. We will have 2 break even points in this strategy. 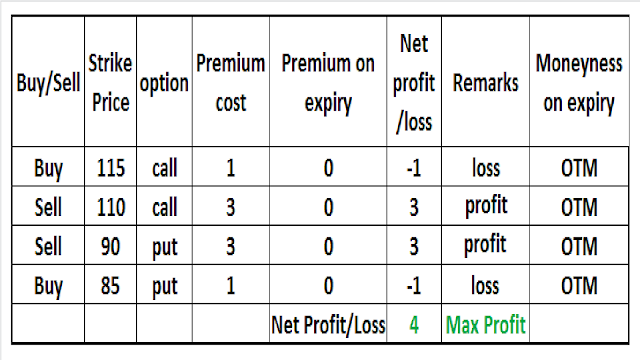 Upside breakeven point=ST of Short call+Net credit received. Based, on above example of ABC, the upside breakeven will come if the stock of ABC on expiry day closes sharp at Rs.114 (110+4=114). Downside breakeven point:=ST of Short Put-Net Credit received. If stock of ABC expires sharp at 86(90-4=86) as on the day of expiry. 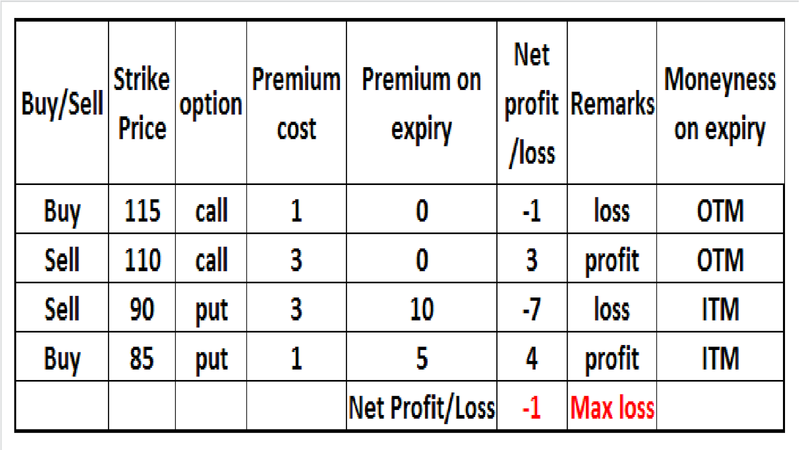 Conclusion: The Iron condor strategy works very well as compared to naked options trading except in naked options trading the profit potential becomes unlimited while risk remains limited.But how often such opportunities of unlimited profit occur?